Improve your food’s presentation with in-stock and custom-printed foil laminated sandwich wraps, colorful basket liners and more. You’ll come to rely on our fast, friendly service and optimum value. Call us today and see the difference we can make. Fax your PO to (708) 478-1118 to send your PO by E-mail. 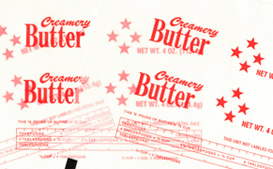 Our solid history of experience working closely with butter manufacturers nationwide is at your service! We offer a broad range of structures that can be tailored to meet your specific needs, from efficient production and wrapping to extended shelf-life for ultimate flavor preservation. So whether it’s a 4 oz. Eastern Elgin, 1# Western Flat, chip paper or a customized configuration, Volflex can provide the wrap, with service you can count on. To learn more, contact your dedicated sales staff today.